New Zealand trout streams do not possess the sheer numbers of aquatic invertebrates found in most North American waters. With the exception of the famous Mataura River in Southland, trout do not have much opportunity to lock onto just one food source–they must take what comes by or they simply may not eat. This opportunistic feeding behavior forces the Kiwi Angler to think more along the lines of presentation over imitation when nymph fishing for trout, and if a trout does not eat your size 16 pheasant-tail or hares-ear nymph, you’d better check your presentation mate. The three things I consider when confronted by a nymphing fish or an orgasmic piece of trout water here in New Zealand, are size, color and weight. Size isn’t too important but is still a factor to consider. Again, this comes down to the lack of numbers thing: mayflies, caddisflies and stoneflies are present in most streams across the size range, and so trout won’t often discern between a size 16 and 18, or a size 14 or 16, etc. Basically, turn over a rock in your river or stream of the day, and choose a fly pattern that’s amongst the size range you see scurrying about. Now as a total simplification, most of the crawlies found in our trout streams can be classified assmall and dark or big and green. Mayflies, caddisflies, snails, chironomids, stoneflies and dobsonflies all fall into this, and so my fly box represents this. We don’t require all the different color variations I see discussed in American magazines. Our fish pretty much have to eat whatever comes past them in the drift. makes things easy for us tiers here in NZ. Weight is the major factor I pay close attention to in my nymph fishing. If you aren’t getting down in the trout’s face, then you simply won’t catch fish. Often, I see people covering fish with no results, switching patterns every second, “because he must have seen that”! Well buddy, I don’t think he did. It’s amazing just how much weight you actually need to get your flies down in fast water, or even through the pools when the fish are feeding deep. It’s always eye opening when you see a fish lift, lift and lift through the water column, and then eat your double tungsten, wired abdomen nymph. Carry flies in a wide range of weights, from the aforementioned double tungsten slim profile depth chargers, to fluffy unweighted nymph patterns, when fish are feeding just below the surface or in the slacker edgewaters. A double tungsten size 16 pheasant-tail or copper john can be just as deadly on my of our headwater streams. So to the fly Box! I get by on a handful of nymph patterns each season, tied in different sizes and from unweighted, to lightly leaded, to beaded and double tungsten. I’m never slow to add split-shot when I think I’m not quite getting there either. Let’s look at a small list of some of my favorite standbys that are sure to get you into fish throughout New Zealand. Remember though, it all comes down to presentation, and if you don’t get the fly drifting as desired, in front of the fish, they will not take it. The Simons Uglies is a commercial tie from Simon Chu and Manic Tackle. A bling fly that gets noticed with its flashy materials, provides movement with its rubber legs, and most importantly, gets deep via double tungsten beads and a slim profile. Many people underestimate the importance of depth when nymphing, and sure, whilst fish will often lift for a suitable pattern, but if your fly is right down there in their face, there’s less chance of the trout munching a closer and easier to reach morsel of food. As previously mentioned, sometimes standard tungsten flies just don’t cut it for depth. The movement and flash of the ugly also assists in catching the trouts eye, making your fly stand out from the crowd, while retaining a fish catching profile. Fished it in green and red in off-colored water or in low light conditions. Tied in Black and Purple is another favorite of mine for this fly. Don’t think Simons Uglies are just for early season trout fishing in NZ, they will produce throughout the season from Fiordland to the upper Mataura and many places in between. Anywhere you need to get down to hook up, a size 10 or 12 ugly fished solo or trailing a wee glister nymph behind will get the job done. Try the hair and copper versions if bright colored bling flies scare you. As Rene Vaz quips, who says the bomb is a sacrificial fly? Basically the Iron Maiden is a fish catcher designed to get deep, fast. 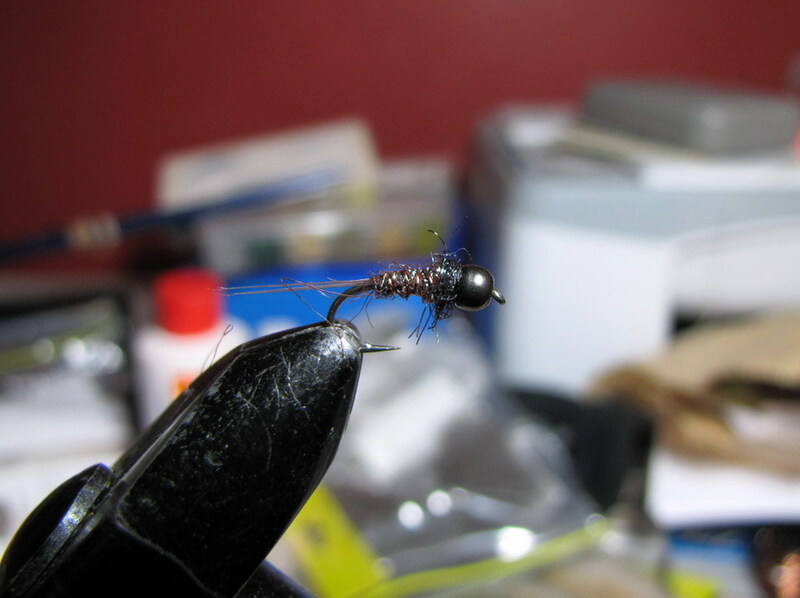 With the snow melt and general fuller flows, this heavy nymph will get you down into the bingo zone with it’s two tungsten beads, wired abdomen, heavy gauge hook and epoxied wing case. This slim profiled small nymph drops like a stone in the water, without all the hassles associated with casting larger and bulkier leaded bombs. You can tie it down to #16 in green, copper or my favorite, wine. 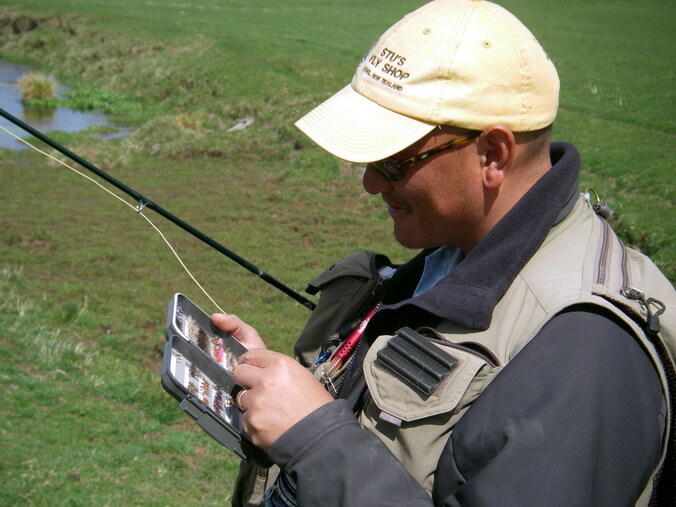 This is a fly pattern I keep close at hand anywhere trout swim. This is my top fish taker and is simply a hare and copper tied, using Veniard brown glister sparkle dubbing. This material provides what I like to call “subtle bling”. It gives off just enough flash to get the fly noticed in amongst a bunch of naturals, yet not so much to alert our wary southern browns. Tie it weighted, double beaded, unweighted, on a curved or straight shanked hook. Just put it out there in front of the fish and let the good times roll! It pretty much imitates anything small and dark for all our aquatic species. Tie it slim for a quick sinker or fat and buggy for a slower sink when fishing around edgewaters or lake margins. The Hotspot Green Caddis is my first choice for rocky headwaters where the free living caddis makes up a large portion of the backcountry trout’s diet. The slender body also suggests stoneflies, so we are really killing two birds with one stone when fishing it. Ensure you carry some extra heavy models for the faster bouldery runs, because getting down to the correct level is often essential in our southern backcountry waters. However, it’s also important to carry smaller and lightly weighted versions for the shallower low land streams and edgewaters. Vary the color and size of the hotspot to see what hits for you. I like a touch of red or hot orange at the head just to catch the trouts eye. Simply sparse, soft-hackled wets as fished anywhere in the world. Spiders not only excel in teams on stillwaters or swung across wide slow pools, but pretty much are suitable for any water fished as droppers behind any of the above fly patterns I’ve mentioned. I tie my spiders in a wide range of colors with whatever soft-hackle feathers I have on hand. Keeping them sparse, seems to be the only requirement: trout simply love them! So there we go folks, a base selection for the tying enthusiast or a range for the minimalist. With the above fly patterns in your box and a couple of slack line casts in your repertoire, you will bend graphite on any Kiwi trout stream. Get out here, give them a swim and enjoy.